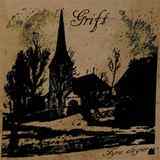 We would have to accept Swedish duo Grift word about the lyrics of their mini-CD Fyra Elegier having strong connections with famous Swedish poets, their metaphors and expressions. I can’t honestly claim to know of many Swedish wordsmiths, and even if I did, understanding them in their native tongue, with vocals distorted and processed through some sort of vocorder device as Grift does it on the opener Dodens dad, would be impossible. What is easier, however, is to digest Fyra Elegier in one quick sitting, immersing yourself in the rustic atmospheric black metal Grift plays. Not everything on the album is diffuse and atmospheric like Dodens dad, Fortappelsens folk starts out quite a bit more assertive, Den fangne slowly builds it up and the closer Bortgang has some thundering double bass poking through. Most importantly, whether it is rawer old school black metal like Old Man’s Child or Kampfar on Fortappelsens folk or more reserved storytelling of Den fangne, Grift never loses sight of what they want to express – sadness and anxiety, but with an ancient decrepit angle to their whole palette. At times gloomy and despondent (Dodens dad), but next episode more lullabying and peaceful (melodic insert around 3.5 min in Fortappelsens folk), the duo also uses native instrumentation at the beginning of Den fangne and overt Vintersorgy Nordic melodies in Fortappelsens folk so that their origin is unmistakable. Always striving to add layers onto their onion, I can’t say that I loved every moment on Fyra Elegier. Here and there it can sound like a more one-note Agalloch, especially if the music goes meandering. More focused Fortappelsens folk and some beautiful melancholic melodies interspersed throughout bring the record back and give it some necessary earthiness. Given that Fyra Elegier is the first work by the band, it is an interesting debut. Those who enjoyed early Kampfar, the atmospheric black metal from British Isles (Fen), as well as Forests of Witchery by Thy Serpent may like this as well. Fyra Elegier combines all of those trends carefully trying to trudge the path all its own.